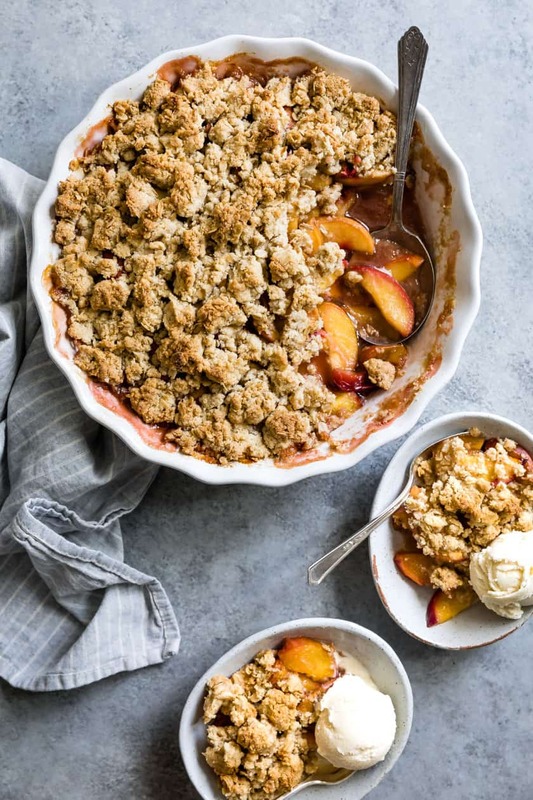 This gluten-free brown sugar peach crumble make a quick crowd-pleasing summer dessert. Warm caramelized brown sugar peaches topped with a vanilla-scented almond flour and oat crumble reminiscent of shortbread. 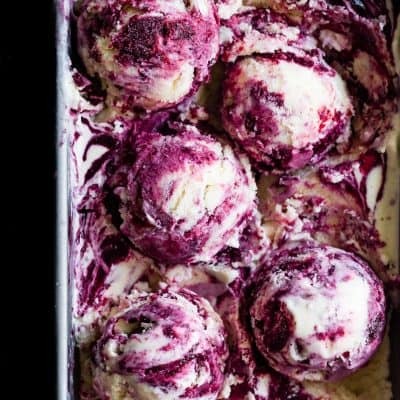 Don’t forget the scoop of vanilla ice cream to melty on top! As we head into the slow-down days of summer, I can’t figure out if my longing for vacation is because it’s that time of year or because I’m just plain tired from being 36 weeks pregnant. Probably both. 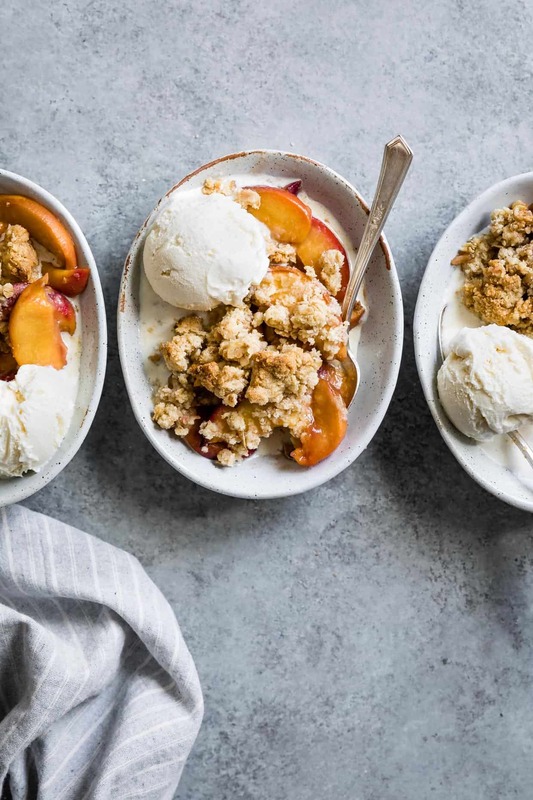 I’d like to take the next 4 weeks to just entertain friends in the backyard sun with iced tea, grilling, and this gluten-free brown sugar peach crumble – while the tots splash in the kiddie pool. 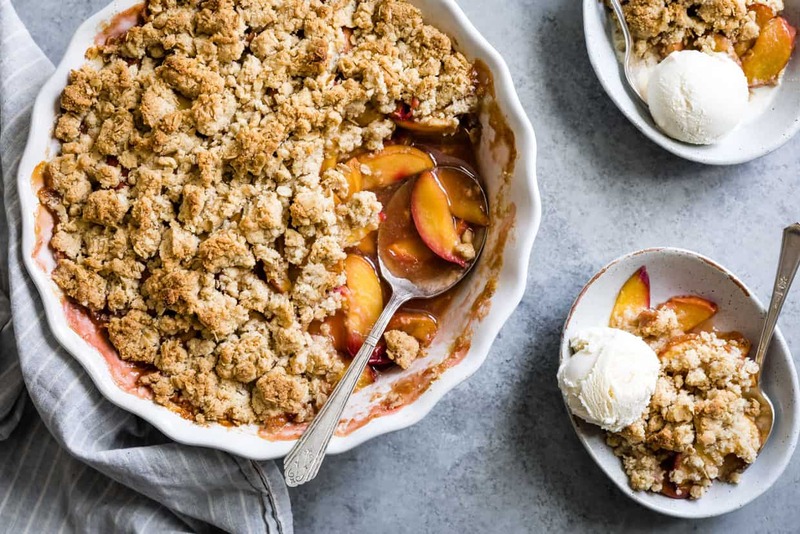 This peach crumble is the fourth recipe in my year-long partnership with Bob’s Red Mill. 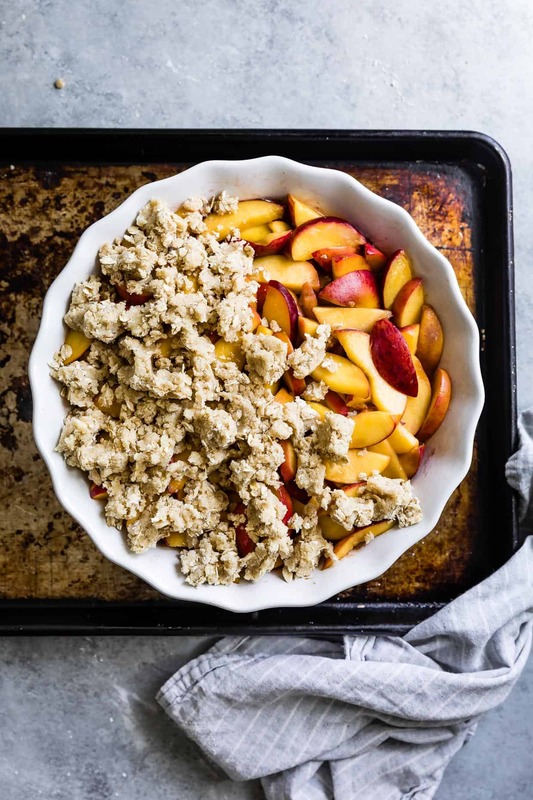 First we ate chamomile oat waffles, followed by matcha macarons with mango buttercream, then buckwheat crepes with roasted cherries & chocolate, and now we’re diving into summer with this brown sugar peach crumble. It’s time to invite your friends over for a backyard bash. 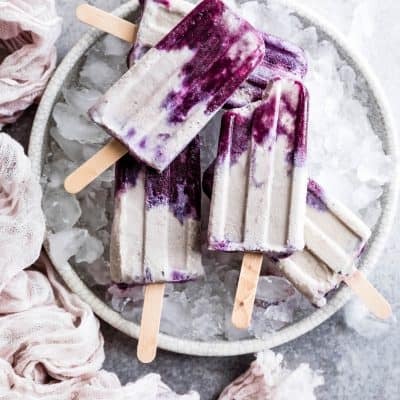 Just one more summer dream request – I’d prefer to do all that relaxing entertaining while not being pregnant anymore, but like, also without a newborn in tow yet. Just a couple weeks off from constant exhaustion, uncomfortable sleep, and sore swollen feet so I can store up enough energy to manage a new human and a bossy toddler all at one time. Who’s been there? Even though I’m in crunch mode trying to get all my work done before baby comes (ANY DAY NOW), my heart is on summer vacation, sipping blackberry hibiscus spritzers and sharing gluten-free peach crumble à la mode in the sun with friends. Also my heart is napping. 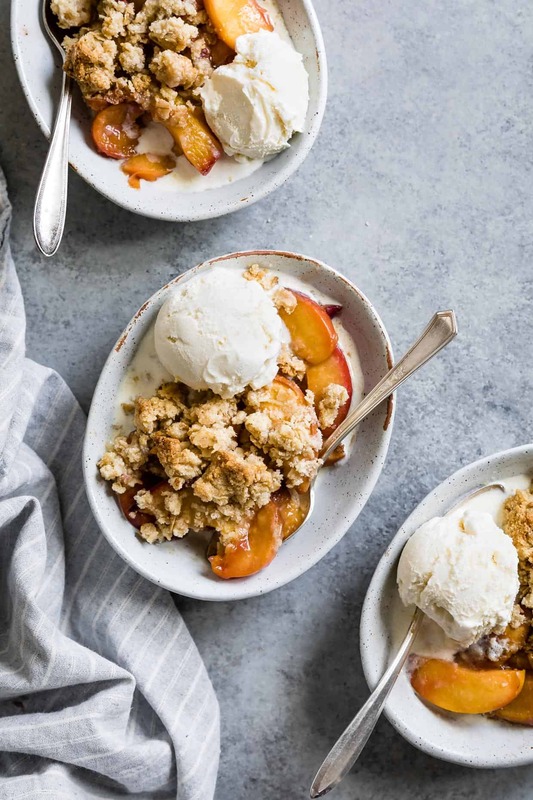 I went back and forth on whether to call this dessert a peach crumble or a peach crisp. I found conflicting sources that said one has oats while the other doesn’t and vice versa, and then a third that said that’s a passé distinction and they’re interchangeable now. 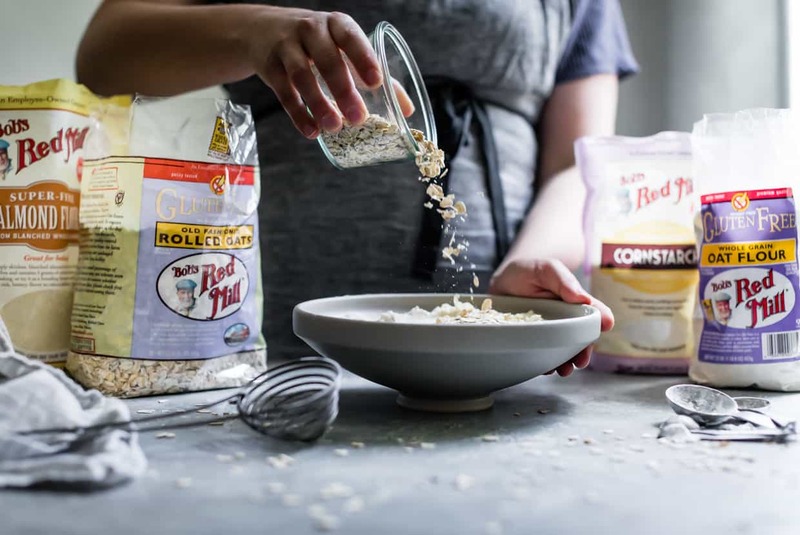 To be clear, this one has gluten-free rolled oats – they add texture and make the topping hearty. 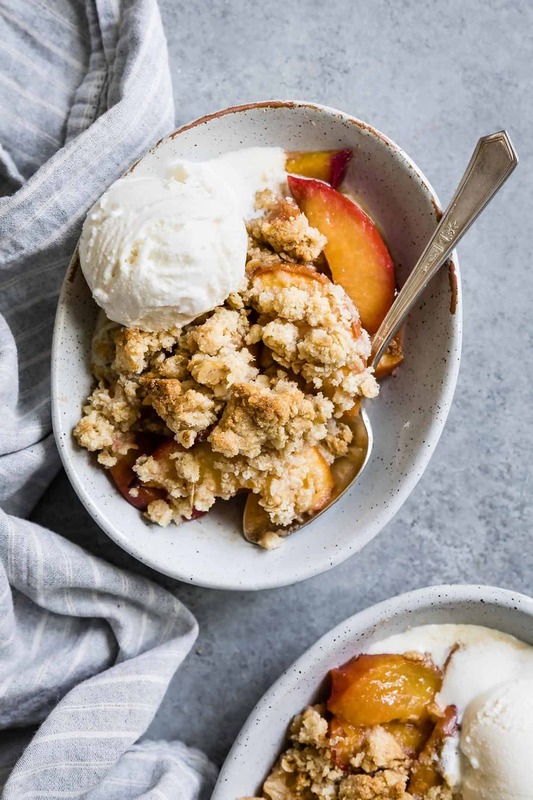 To me, the topping resembles crumbly chunks of shortbread more than crisp streusel, so that’s where I landed – peach crumble. 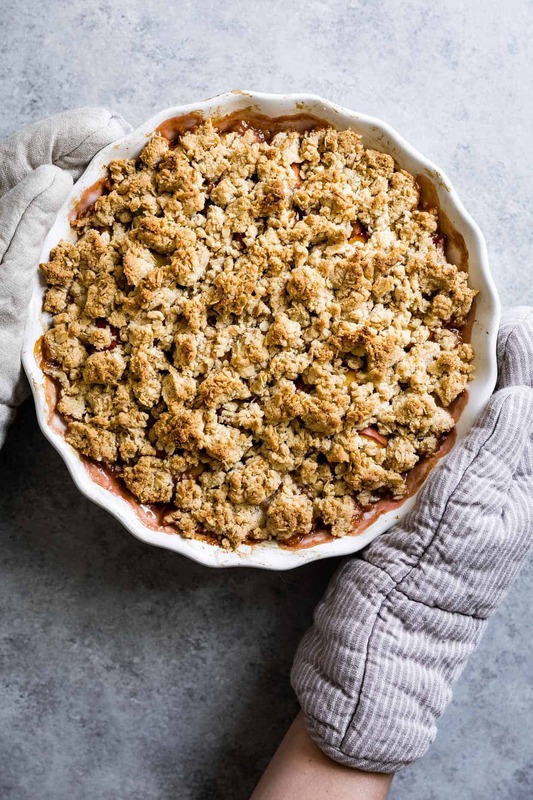 Do you have strong feelings about the difference between a crumble and a crisp? I don’t. Just as long as there’s caramel-y brown sugar peaches underneath. 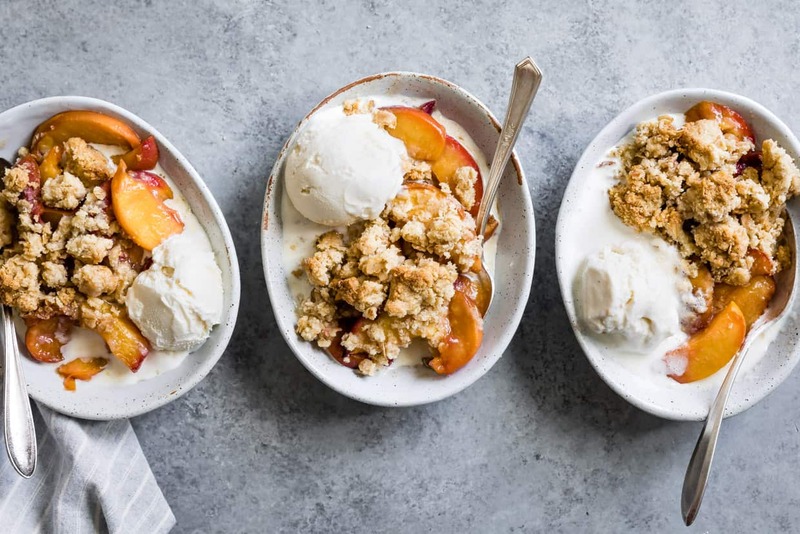 When butter and brown sugar melt into the peaches while the crumble bakes, they meld into caramel-like syrup that’s the stuff of dreams. 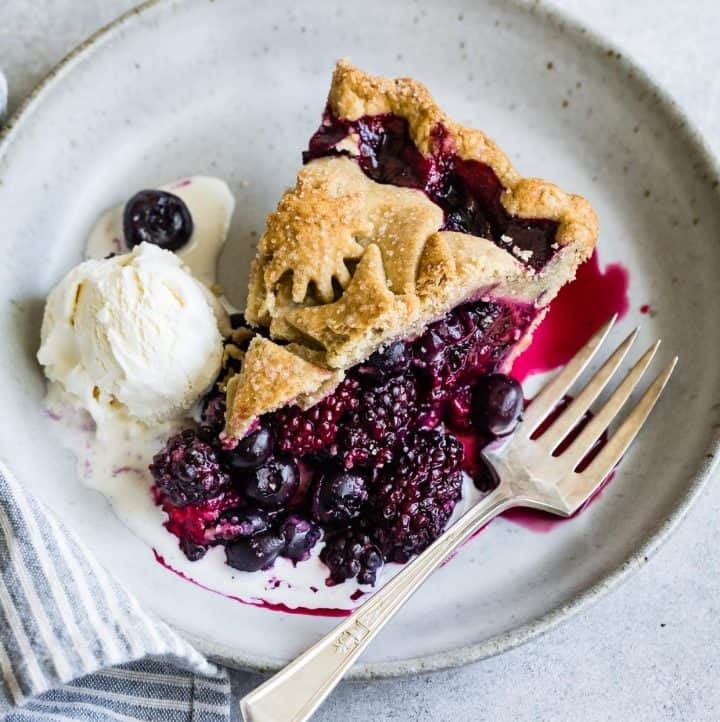 On top we’ve got buttery, sugary pastry crumbles that gets its flavor and texture from a combination of oats, almond flour, oat flour, sweet rice flour, and corn starch. 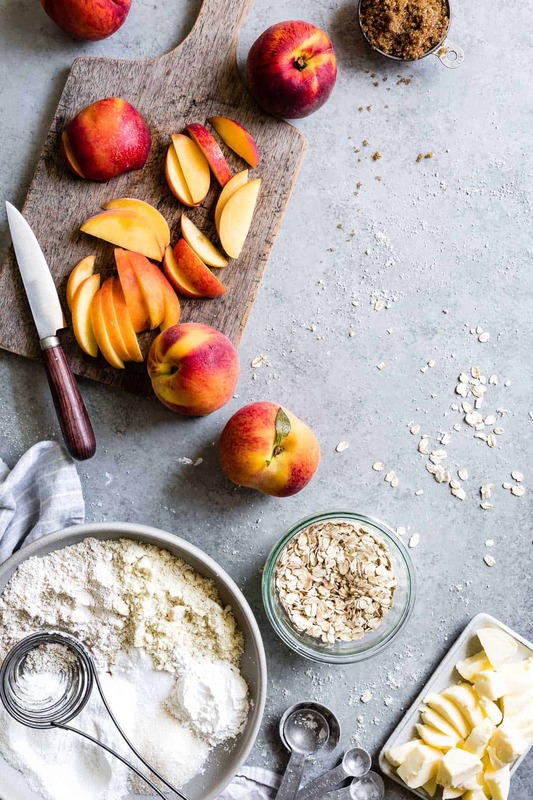 Let’s break down the anatomy of these crumbles: I consider all of these flours/grains pantry staples for gluten-free baking, so if you feel overwhelmed about buying five things, search my recipe index and you’ll find at least 50 other uses for them quickly. 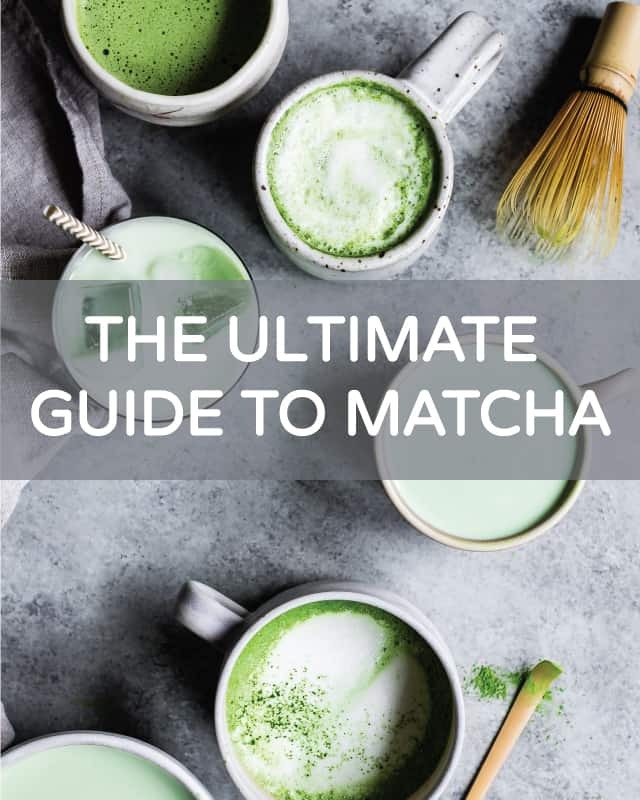 In fact, I’ll even give you an option to turn it into just 4 things: grind up some gluten-free rolled oats in a high powered blender or food processor to make your own gluten-free oat flour. 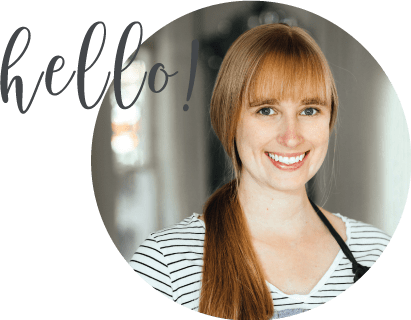 The oats and oat flour here are the base – as a gluten-free baker, I keep large canisters of sugar and of gluten-free rolled oats on my counter and I use them both almost daily. 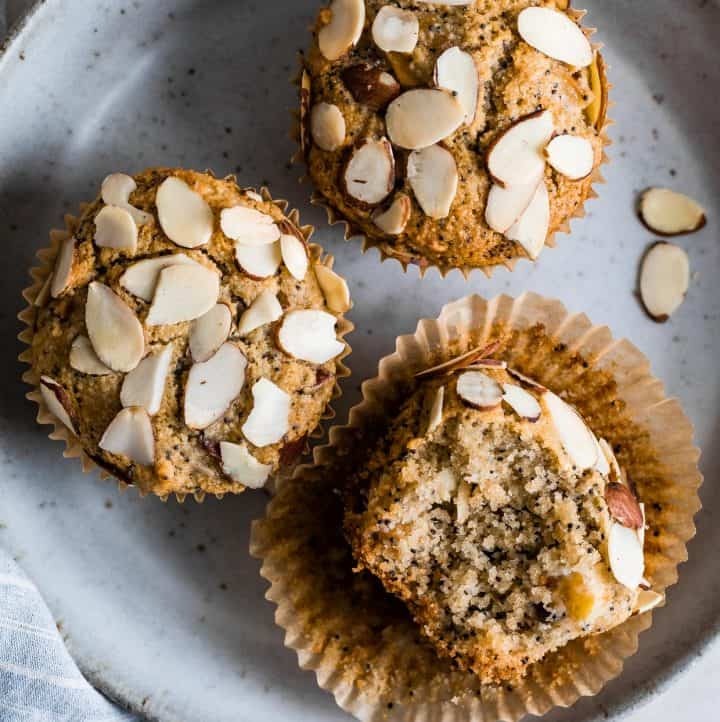 Oat flour gives a soft cakey texture to baking, helping to give your baked goods a delicate crumb. Left alone though, your baked goods will likely be too crumbly so they need some help from other flours. The flavor booster is the almond flour, adding sweet nuttiness that pairs well with the buttery crumbles. Bonus, you can use the leftovers to make matcha macarons and an almond dutch baby. Sweet rice flour has the stick-it-together power that adds chewiness to your baked goods. When used in combination with some delicate flours like oat flour, it’s the secret weapon of gluten-free baking. 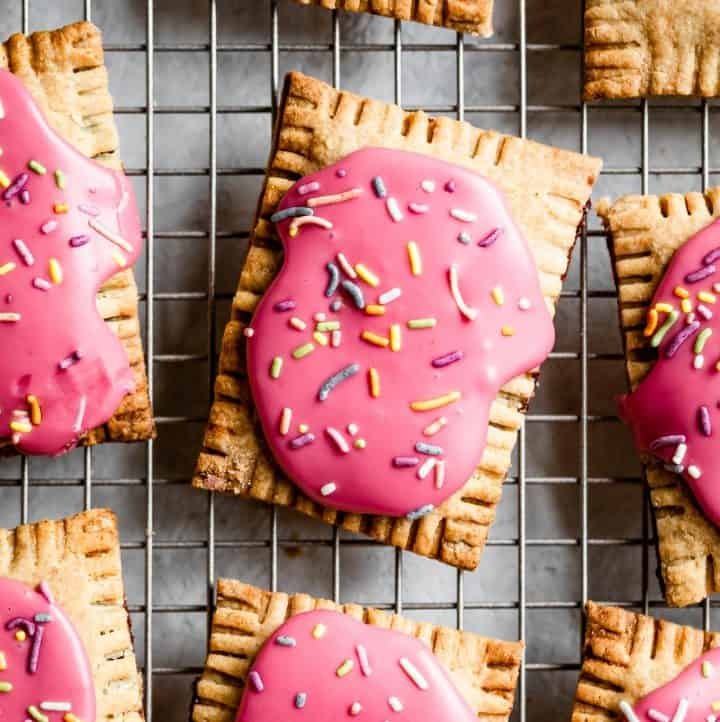 Here are some other ways to use up oat flour and sweet rice flour: gluten-free raspberry vanilla cake, gluten-free strawberry balsamic thyme galettes, or gluten-free chamomile oat waffles. The bit of corn starch also helps with binding and also absorbing moisture to give your crumbles the ideal crispy crumble topping texture. Now that you’ve got your caramel-y brown sugar peaches and buttery crumbly topping in order, it’s time to invite your friends over! And don’t forget a quart of vanilla bean ice cream to serve on top! Disclosure: Special thanks to Bob’s Red Mill for providing the flour shown above and sponsoring this post! And thanks to you for supporting the companies that keep Snixy Kitchen cooking. In a large bowl, prepare the filling. 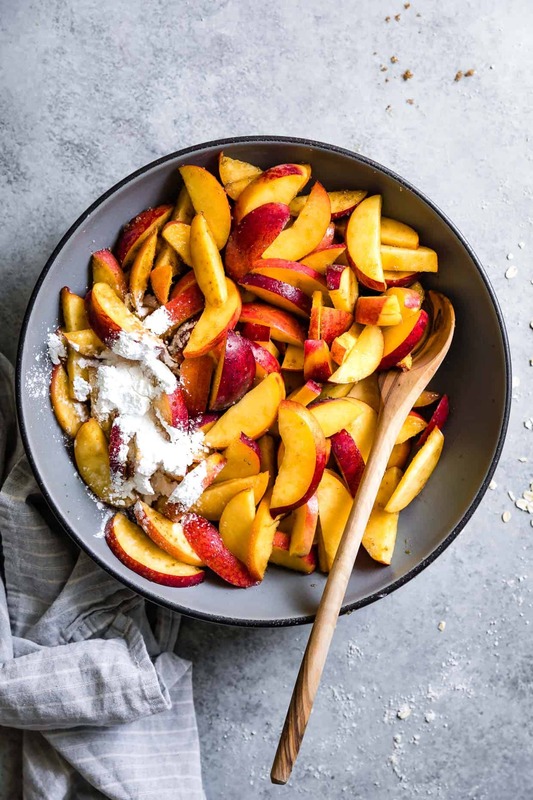 Toss together peaches, brown sugar, corn starch, and vanilla extract. Pour the peaches into a 2-quart baking dish, pan, or pie pan (I used a 10-inch deep dish pie pan). Evenly place butter chunks over the top. 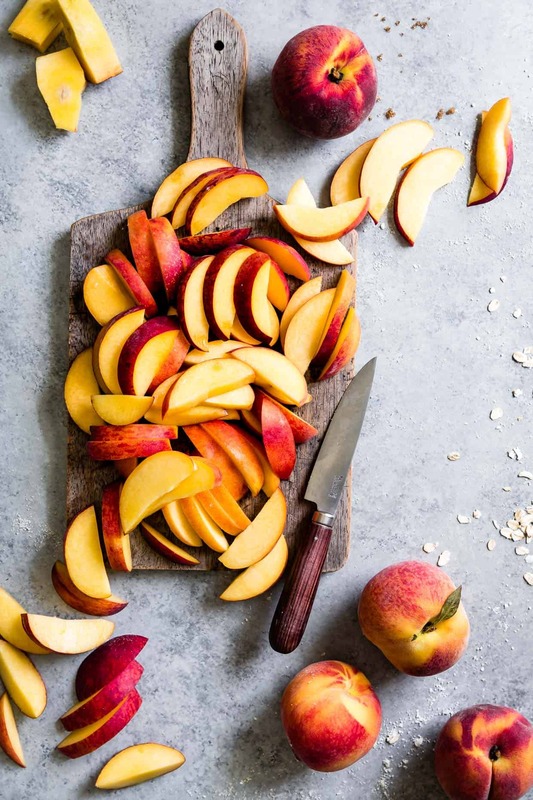 Place pan on a large baking sheet to catch leaks, and bake peaches for 20 minutes, until beginning to soften. 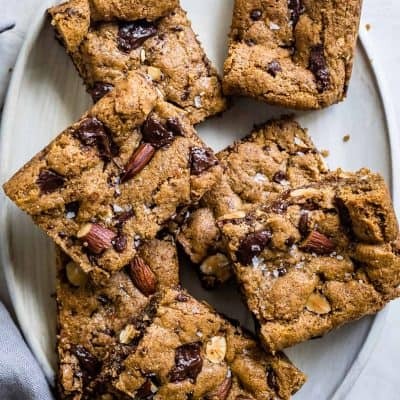 Meanwhile, combine rolled oats, almond flour, sweet rice flour, oat flour, corn starch, sugar, baking powder, and salt in the bowl of a stand mixer or a large mixing bowl and whisk to combine. 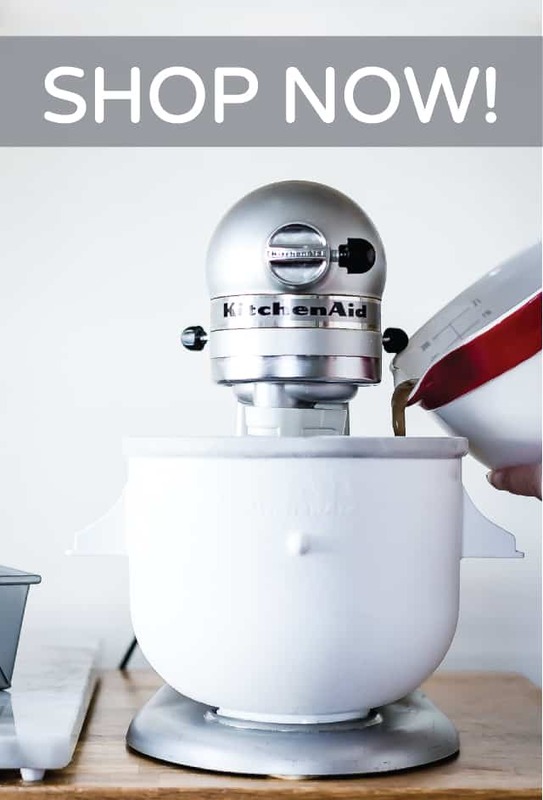 Add the cold butter and vanilla extract and, if using a stand mixer, beat with the paddle attachment on medium speed until the dough clumps together when pinched. 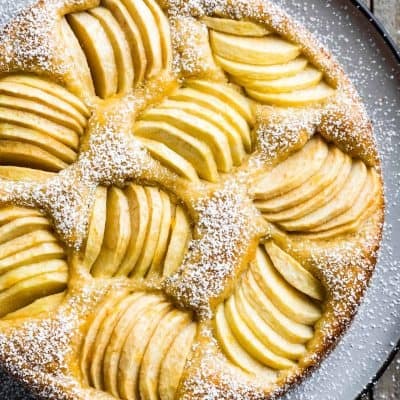 If working by hand, cut in the butter by hand or with a pastry cutter and mix until the butter incorporates and the dough clumps together when pinched. Top warm peaches with crumbles of the dough and bake for 40-45 more minutes, until the filling is bubbling and the crumbles are golden brown. Oh this looks just divine! Will make next saturday for family. I hope the rest of your pregnancy goes really smooth … I am sure you will find the energy to “do it all” once the baby comes. Your posts are so beautiful. It’s time for a vacation, Sarah. Seriously! But I know how we can put it off because life is so full… it’s hard to fit it all in sometimes and then you blink and summer has slipped away. Rob and I just booked a July vacation (with a little nagging on my part :D ). I absolutely melt over brown sugar and peaches. 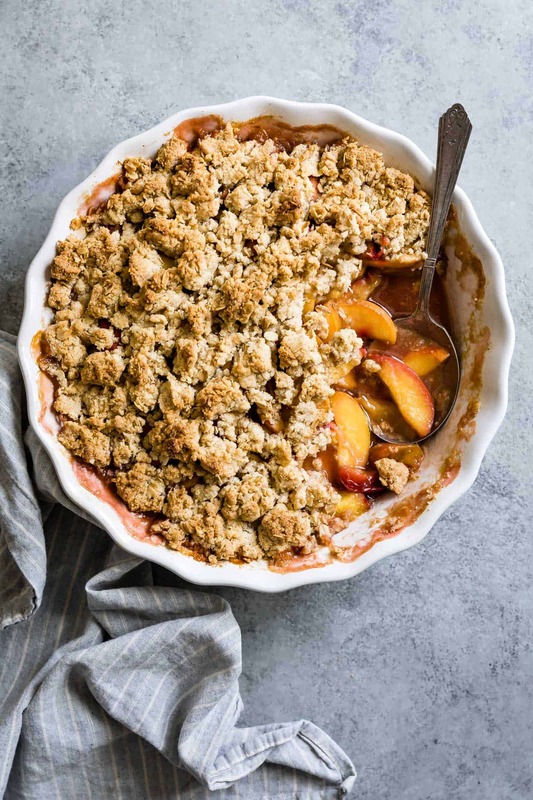 Your crumble/crisp is perfection my dear… no matter what it’s called! 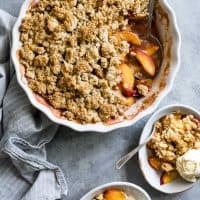 Peach Crisp or Crumble, either way it’s one of my all time favorite summertime desserts! Just wish our peach tree had actually produced peaches this year! No worries, I’ll just visit the local peach ranches around us! I have a soft spot for warm, sugary, baked peaches….omg, this looks sooooooo good!! The crumble/crisp thing is a tough one. My take is that it’s a crisp if the oats are ground up and make a single “crisp” layer on top, and a crumble if the oats are in big beautiful clumps like they are here. 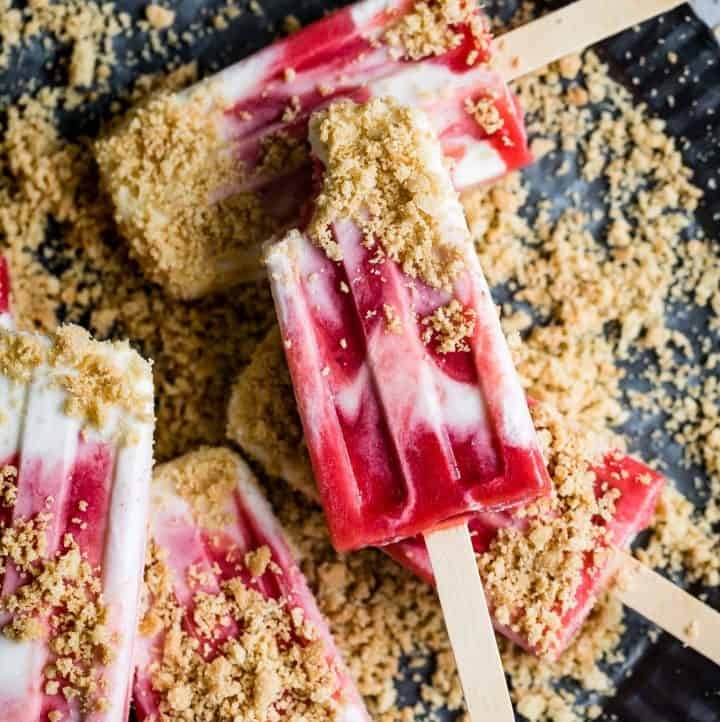 Whatever it’s called, this dessert is a summer dream and I can’t wait to make it! The recipe calls for cornstarch. The instructions call for minute tapioca which is right, used tapioca it’s in oven now also used cinnamon in the crumble as well as vanilla. 6 guests for dinner hope it turns out. Thanks for letting me know! I’ve made this 2 times this month and never caught that typo! I actually do use corn starch to thicken here (to make it fewer flours since I use it in the crumble too), but I just as often use tapioca starch to thicken and both will work equally great for the filling! Adding cinnamon sounds delicious! Hope you loved it!